Please email us at info@tinybearpoms.com for more information. Sorry we don't have any available dogs or puppies. Please check back for updates and join us on Facebook. Our pomeranians are all purebred and registered. We take pride in knowing that our dogs receive the best in medical care, training and are socialized from an early age. Pet puppies are sold already spay/neutered and come with limited CKC registration. All puppies come with up-to-date shots and are micro-chipped for security. Puppies will only be sold to qualifying buyers. Pomeranians are delicate dogs that need safe home environments, quality veterinary care and dedicated ownership. If you cannot commit to caring for the dog for it's entire life, please don't apply. People who give their dogs away may not realize it but doing so can have profound psychological effects on them which may result in major behavioural challenges. A dog is a LIFETIME commitment. As we retire some dogs from the whelping pen and/or show ring, they may become available to buy as pets. These dogs are usually about 3 or 4 years old. They are fully trained and will already be spay/neutered. The same pet ownership commitment is required. Please enquire as to the price of the adults. Adult dogs can be a great companion for someone who doesn't have the time necessary to commit to a puppy. Remember, puppies are like babies and small children. They need more of your time than the adults. For more information, please feel free to e-mail us with your questions. Not ALL breeders are equal. Finding a reputable breeder should be a most important consideration when searching for a family pet. We all have seen internet ads for lovely little puppies and at times even see them in stores. The prices can differ greatly, as can quality and health. When you buy from the pet store or people who breed their own pets at home, you are supporting the continuation of poor breeding. People who breed their pets, often don’t know anything about the bloodlines and don't do the health testing or temperament testing needed to insure a healthy litter which may create an unstable generation of dogs. Buying from a reputable breeder supports the correct way of breeding and preserving the breed. Beware of any Pomeranian breeder who is not a member of the Canadian Kennel Club. Membership and registrations are not expensive. The CKC provides breeder education and requires all members to adhere to strict codes of ethics. In Canada, dogs can only be legally sold as purebreds if they are registered in one of the few recognizable registration bodies, including the Canadian Kennel Club, Canadian Border Collie Association, the Canine Federation of Canada, the Working Canine Association of Canada and the Canadian Livestock Records Corporation. When buying a CKC registered dog, be sure they mean Canadian Kennel Club registered and not Continental Kennel Club. Recognize that registration is only one part of the qualifying process. Even CKC dogs can be Backyard- bred or come from puppy mills. When looking for a dog, ask about health testing, titles, and look at how they care, train and vet their dogs. Offering to meet you at a shopping mall or any place other than where their dogs are raised is not acceptable. Any breeder, who agrees to sell you a dog that you have not yet seen and/or who has not asked detailed questions about you, is suspect at best. A reputable breeder does not treat their dogs as a commodity that gets sold to the first person who has money. A reputable breeder will want to know that you are informed and prepared to care for the dog for its life and will qualify you through a series of interview questions and references. Check these links which provide information to help you qualify a breeder. The Canadian Humane Society and the Canadian Kennel Club both have important information to aid you in the selection of a reputable breeder. Read the following articles to discover the True Cost of owning a dog. In concert with our core beliefs, we are committed to producing healthy and conforming dogs per the Canadian Pomeranian Standard. It is our mandate to learn, participate, educate and advocate for the dogs. We are committed to ethical breeding and to transparent business practices. It is because of our dedication to our breeding program and to our dogs in general, that we provide full disclosure regarding all information known to us concerning our dogs' personal and ancestral health and coat histories. 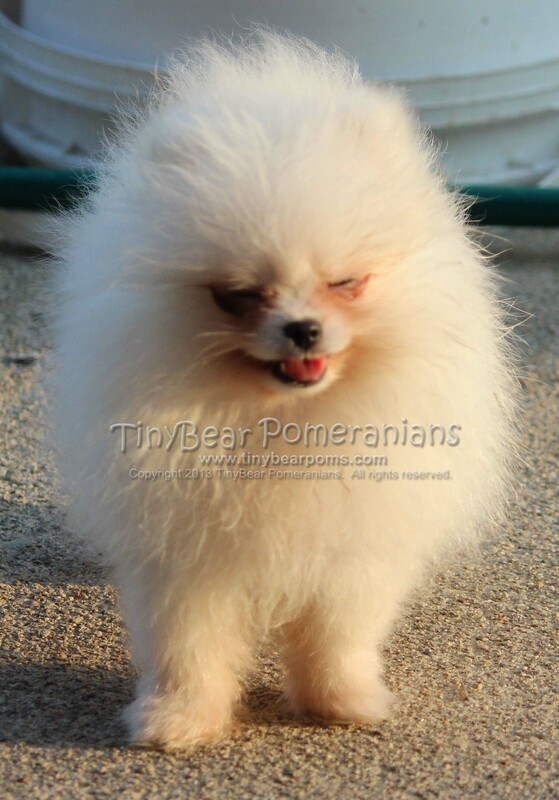 From the beginning, TinyBear Pomeranians has provided a comprehensive guarantee for genetic defects including Alopecia X. As we do not value our companion animals less than our show and breeding prospects, our Alopecia X specific clause includes a 4-year purchase-price-refund for ALL dogs sold by us. Our contract details this assurance. It is our hope that this exemplary warranty demonstrates our commitment and instills confidence in the pet and breeder communities. Alopecia X, sometimes called BSD (black skin disease) is a ‘hairloss’ condition which has been known to affect several of the Nordic breeds. It’s more common in younger males but has presented in females and older dogs. There are many theories and much confusion surrounding this condition. As the science progresses, we will learn more about causation and hopefully develop a protocol for breeders to follow when deciding on mating pairs. The good news is that this is only a ‘cosmetic’ problem. Dogs that are affected with this problem are not sick. They are not in pain and they do not have a shorter life expectancy than dogs that are not affected. More good news is that research is underway and the American Pomeranian Club is collecting donations in hopes of having the Pomeranian Genome mapped. Mapping the Genome should lead to a test which will help breeders to know if they have a ‘carrier’ dog in their breeding program. TinyBear Pomeranians is dedicated to helping with this mission. Dr. Paul Eckford of TinyBear Pomeranians has been appointed as Chair of Health and Genetics for the Pomeranian Club of Canada and to the Canadian Kennel Club’s Medical and Genetics’ Committee. Paul is dedicated to working on behalf of the breeders and pet owners on Pomeranian health and genetic issues.